Schools awaiting the completion of buildings affected by the collapse of British company Carillion have been told that it is likely to be May at the earliest before work resumes on the sites. At a meeting today with the State's National Development Finance Agency and Carillion's former partner in the venture - Dutch Infrastructure Fund (DIF) - representatives from the six schools and colleges involved were told that a tender has been issued for the completion of the works. The tenders are due to be returned by early April. DIF told school representatives it was unable to say how long it would take to award the tender but that it was unlikely there would be physical progress on the projects until May. It's understood the meeting was told that all the buildings would be completed and ready for occupation by next September. The six buildings involved were being constructed as part of a "bundle" under a Public Private Partnership agreement with an international consortium made up of Carillion and DIF. A Public Private Partnership is a mechanism for outsourcing public works to the private sector. 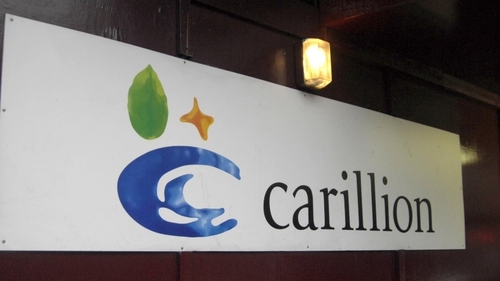 Work at the six sites halted seven weeks ago after the collapse of Carillion caused concern among subcontractors as to whether they would be paid. RTÉ News has spoken to a number of subcontractors who are owed substantial sums of money for work they have completed on the schools. The six projects are school buildings for Loreto College, Wexford, Coláiste Ráithin and St Philomena's Primary school, Bray, Eureka Secondary School, Kells, and Tyndall College and the Institute of Further Education both in Carlow. In the case of the Wexford and Bray schools the buildings are virtually complete. The other buildings are around 90% completed. Irish company Sammon Construction was the main contractor on the six sites. The principal of Loreto College in Wexford has told RTÉ News the school is happy that there is now a process in place. Billy O'Shea said they were "feeling quite good". "If it takes until early summer", he said, "we're happy with that." However the principal of Coláiste Ráithin in Bray has expressed disappointment that it will now be September at the earliest before his pupils and staff can occupy the new building, which is complete apart from certification and other minor issues. Today's meeting was held at Department of Education offices in Tullamore, where its Planning and Building Unit is housed. Asked on Friday to comment on the current situation with the schools, Minister of Education and Skills Richard Bruton told RTÉ News that it would not be proper for him to comment.